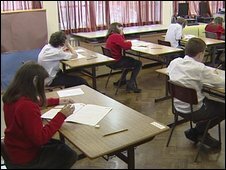 Primary school principals from across Northern Ireland are to meet later to discuss their concerns about the proposed grammar school entrance tests. Details of examinations in English and maths to be held later this year have already been released. Thursday's conference has been organised by teachers' unions. Brendan Harron of INTO claimed some schools are being forced to consider abandoning the curriculum to focus on the tests.